Khloe Kardashian hopes her parenting style will be similar to that of her sister Kim Kardashian West. The 33-year-old reality star is expecting her first child, a daughter, with her boyfriend Tristan Thompson in a matter of weeks, and has said that out of all her sisters who have children already - Kim and Kourtney Kardashian, as well as Kylie Jenner - she thinks she'll be most similar to Kim when it comes to motherhood. Khloe - who is also sister to Kendall Jenner - wrote in a post on her app on Wednesday (28.03.18): ''I can't believe my little girl will be here soon! These past nine months have flown by, and I've loved every minute of it. So far my pregnancy has been super easy and I'm so beyond thankful for that. After my first trimester everything has been a breeze. Kim, 37, is mother to four-year-old North, two-year-old Saint, and two-month-old Chicago - who was born via a surrogate mother - all of whom she has with her husband and rapper Kanye West. Kourtney, meanwhile, has three children of her own - Mason, eight, Penelope, five, and Reign, three - with her former partner Scott Disick, and youngest sibling Kylie Jenner, 20, gave birth to her first daughter Stormi almost two months ago. 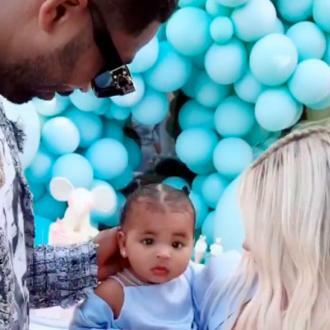 Recently, Khloe revealed she'd love for her unborn daughter to inherit the intelligence of her NBA player father, whilst also hoping she is blessed with Khloe's ''street smarts''. She wrote: ''I can't wait to meet my baby girl! I often think about what she'll look like and what her little personality will be like.